The HD67507 is a "Slave (server)" from the side Ethernet and is "Master" from the side Rs232/Rs485. So, you can connect a "Master (Client)" Modbus TCP with one or more "slaves" Modbus RTU in order to exchange information between the Modbus TCP master and the Modbus slaves. 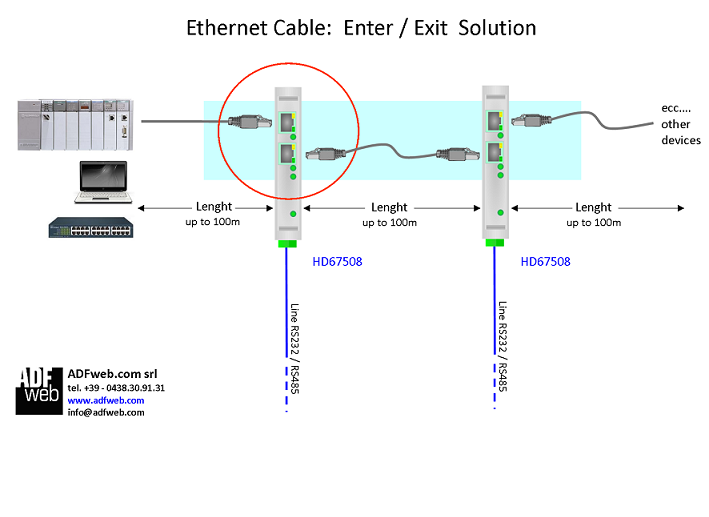 It is able to manage up tp 10 simultaneous connections from Ethernet side. The HD67507 is available also with the Wi-Fi version: it allows to interface a Modbus TCP Master with some Modbus RTU slaves. The Modbus TCP connection is done over Wi-Fi. The order code is HD67507-WiFi-B2. 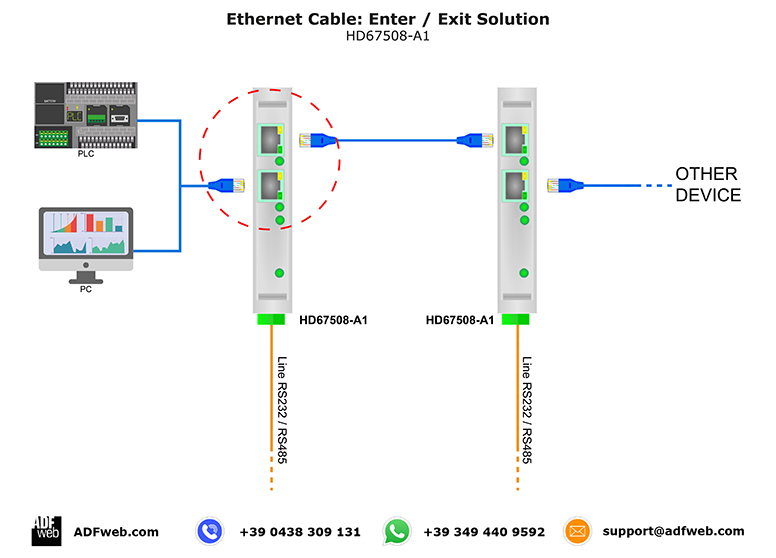 The HD67508 allows you to connect some Slaves Modbus RTU to a Master Modbus TCP over Ethernet . That device differs from HD67507 because has 2 LAN ports , which allows the Ethernet connection in series of several Ethernet devices. This system is an excellent field of use in systems of Industrial Automation (IAS) or inside of the Building Management Systems (BMS). The HD67510 is a "Slave" from the side Rs232/Rs485 and is "Master (client) from the side Ethernet. 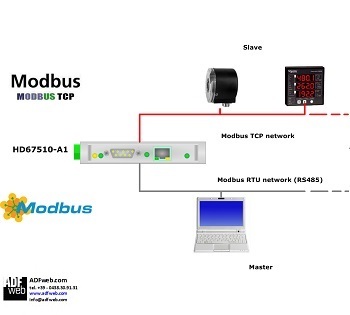 So you can connect a "Master" Modbus RTU with one or more "slaves (servers)" Modbus TCP in order to exchange information between the Modbus master on a serial and the slaves on the Ethernet. It is available in two order codes: the HD67510-A1, and the HD67510-B2 (different for types of housing). The HD67516 allows you to connect some Master Modbus RTU with one or more Slaves Modbus TCP over Ethernet . The device differs from HD67510 because has 2 LAN ports , which allows the Ethernet connection in series of several Ethernet devices. These converters are contained in a metal housing, so it is STRONG and RESISTANT to the vibrations and shocks. The electrical parts are with triple isolation of 4000 V between Ethernet/Modbus - Ethernet/Power Supply - Modbus/Power Supply.